The Promise is the third Side Project’s series on youth and war (see the other two here and here). 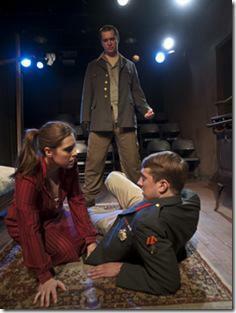 Set in WWII Russia, this is the story of three teenagers who form a family out of trauma and loss. In America, war is a distant thing of which stories are told and legends fabricated. 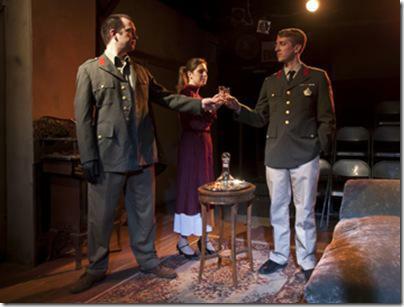 Aleksei Arbuzov’s play brings war front and center in a palpable and non-sentimental way. Lika is a 16-year old girl from an aristocratic family hiding in a bombed out apartment complex. Lika has been hiding out in what she thinks is an abandoned apartment when one of the occupants returns in the middle of winter. Elise Spoerlein plays the role of Lika with grace and the hard earned wisdom of a child forced into survival mode. Stephen Dale plays Marat – a young man who carries a sense of duty to the state from his naval officer father. Dale possesses an expressive face and fantastic stage presence. He bursts into the apartment and forges a bond with Lika. They are at odds because Lika has burned almost everything that would ignite to keep warm during the brutal winter. His family photos and furniture is gone except for the couch. Marat and Lika have no illusions about living beyond the next day and become uneasy allies and gradually more. As their wartime idyll grows, Leo (Edwin Unger) literally falls into the apartment with an armful of firewood and pneumonia. Lika and Marat warily look after him until he comes around. As Leo, Unger finds the perfect chemistry and sexual tension that exists between the three. 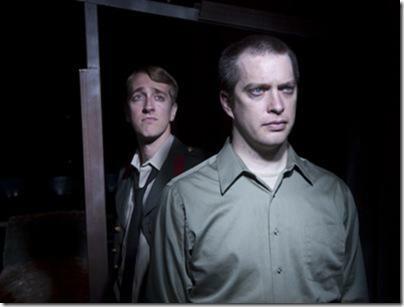 Unger evokes a haunted soldier with an emotional hole in his psyche. When Leo tells his story of his mother and her lover starving to death before his eyes, it is spellbinding. Leo immediately becomes a comrade in arms and hearts. They promise to be family for each other and remain in communication before the war and ensuing years divide them physically but never emotionally. The progress of the years after WWII is shown in projections that are very reminiscent of what I remember to be the Iron Curtain. Stalin was determined to build a Soviet Union that abandoned most of the agrarian and cultural means of living. It is a sad irony that Lika and Leo possess more tender sensibilities even after the horrors of war. Lika wants to be a doctor like her late mother and a ‘woman research scientist’. Even after the horror of stacking dead bodies on sleds during the war she wants to move on in helping those in need, sick, or dying. Leo is a ‘writer of verse’- not a poet, which is deemed too sentimental. Marat possesses the mentality of helping the state and being useful to one’s comrades even at the beginning of the story. Marat is the least damaged mentally and physically after the war. He seems to manage and even thrive under Stalin. Historically, the time in which the second act is set is called Zhdavshchina or era of Zhdanov who was instrumental in repressing and wiping out unsanctioned cultural pursuits and western influenced science research. Leo shows the strain the most, having sustained a devastating injury in battle. The Promise is a beautiful and stirring production that never veers into overwrought sentimentality in spite of the themes of loss. Neither is it overly stoic but a keen balance of internal emotion and love spoken nonverbally. Some lines are spoken in Russian with the translation overhead on screens. The Russian dialog has a sharp impact as if the language and cultural pride bursts from the actors. This is a perfect rounding of the triumvirate of youth and war at Side Project. Bravo! Support Chicago’s live theater!